Whether you are repairing or replacing, roofing work is bound create waste which necessitates working with a dumpster rental service. Before selecting a company for dumpster rental, there are a few things you should know about picking the right service for your needs. If you have been working in roofing for a while, you know disposing of the waste from your projects is not as simple as it may seem. Factors such as weight, type of materials, and time frame have to be taken into consideration before choosing the right dumpster and provider. Weight: As you probably know, there are vast differences in weight between different types of roofing material. 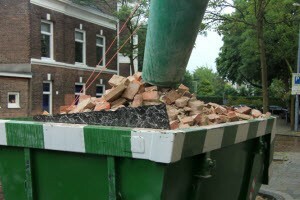 The weight of your waste will determine which size of dumpster you will be renting. Type of Materials: There are some materials which need to be bagged separately instead of including it along with the rest of the waste from your roofing projects. Most Shingle Recycling Centers will only recycle shingles, nails, and tar paper. If necessary, make sure your dumpster rental service can dispose of any additional materials from your roof repair or replacement. Length of Project: Since many dumpster rentals are only for a few days, make sure you know upfront how long you will need a dumpster for your roofing project. Being clear on the length of your project plays an important role in avoiding extra fees or charges. Straightforward: Because of the various factors which play into determining the cost of your dumpster rental, working with a straightforward company will ensure you won’t be surprised when your bill arrives. A straightforward rental company will disclose all fees and charges in writing before delivering your dumpster. Reliable: As a roofing contractor, your client is relying on you to be timely and efficient. Because of this, it is important you work with vendors who have a reputation for being reliable and timely so you can continue meeting your client’s expectations for their roofing project. Affordable: For each project you have a strict budget that must be considered when buying materials, paying employees, and renting services. Dumpster rental is a competitive market. Compare prices and choose an affordable service to guarantee you stay on track with your budget. At Rolloff Dumpster Rental Solutions, we take the guesswork out of selecting a straightforward, reliable, and affordable company for your next roofing project. Call 678.807.9328 to learn more about our dumpster rental service.